Over 200 theatre professionals participated in this season's awards as adjudicators. But what does that actually involve? Here's a little FAQ for y-o-u! Q: Who can be an adjudicator? A: Any current individual member of Theatre Bay Area may apply to be an adjudicator in the TBA Awards program. A panel of Theatre Bay Area staff and/or program steering committee members regularly reviews all applications. Acceptance is not guaranteed. Decisions are based on the application content and the specific needs of the program such as geographic coverage. Each registered company submitting productions for evaluation must fill a seat in the adjudicator pool. These adjudicators are also reviewed by the panel, but are not required to be individual members of Theatre Bay Area. Journalists recruited to participate in the awards program are also not required to be individual members. Overall, the TBA Awards are a peer-adjudicated system. Actors, directors, designers, playwrights, composers, lyricists, administrators, journalists, educators and other theatre professionals are the primary adjudicator profile. Other individuals with a demonstrated history of engaging the theatre community as patrons, board members, philanthropists and advocates may also be considered as long as they can meet the minimum expectations. Q: What does being an adjudicator involve? A: Independent adjudicator applicants commit to seeing an aggregate average of two performances per month for the term of their participation in the program, for a total of 24 performances for a full year. Adjudicators choose their first performance from a list of available complimentary tickets provided by the production. Adjudicators are then assigned to their next production based on their selecting a performance date and time during which they are available to attend a production. The adjudicator can then choose their third production, be assigned to their fourth, and so on. There is no maximum number of productions an adjudicator can attend as long as they alternate between chosen and assigned productions. Adjudicators also commit to recording their evaluation ballots via the program website within 48 hours of attending a production on a ticket received through the awards program. Adjudicators commit to following the written Adjudicator Conduct Agreement regarding professional behavior, ethics, confidentiality and other aspects of the program that must be completed by all adjudicators prior to entering the awards program. Adjudicators commit to following all awards program-related instructions given by the program manager. "Happy customers" by Flickr user uncoolbob. Used under Creative Commons license. Q: How does the evaluation system work? A: Within 48 hours of attending a production, adjudicators log in at the awards program website with their username and password, select the ballot for that production on their profile page and record numeric evaluations (from 0.01 to 10.0) on line on the ballot. You are required to evaluate all ballot lines except those that would create a conflict of interests or where the listed artist was absent from the performance attended. These instances should be rare, and a menu is provided for approved reasons for abstention. Once recorded, ballots cannot be changed. So that's the scoop on adjudication! Any individual member of TBA can apply; adjudicators get comp tickets to watch shows—then they go home, log in, and sing the praises of great work they've seen! Interested in adjudicating for the 2014/2015 season? View the full FAQ and 2014/2015 season application materials here. That's right! All tickets to the inaugural TBA Awards Celebration on November 10 at the historic Geary Theater are now on sale! The TBA Awards Celebration is this year's not-to-be-missed theatre event, an evening for the Bay Area theatre community to come together to recognize outstanding achievement in many professional disciplines in the field. The venue for this glamorous, glittering event is none other than the historic Geary Theater, crown jewel of American Conservatory Theater. So dress to impress, and join us as we honor the performances and productions that have moved us, challenged us, taught us and changed us. Single tickets to the TBA Awards Celebration are now on sale! 2014 TBA Awards finalists get special discounts on tickets. Details here. Groups of 10 or more can get discounted tickets. Details here. After-party at Ruby Skye? Yes! Make sure to get your tickets for the sizzling post-soiree soiree! Buy your tickets here. All ticket orders are subject to a $4.00 processing fee per ticket. Following the awards ceremony, there will be a no-host dance and cocktail after-party at Ruby Skye, just around the corner from the Geary Theater. The party gets going at 10:00 p.m.—come dance the night away! Tickets for the Ruby Skye after-party are $10 per person, and can be purchased from Theatre Bay Area. Click here to purchase tickets to the after-party. Note: The capacity of Ruby Skye is smaller than that of the Geary Theater, so advance ticket purchase is required. Discounted seating is available in blocks of 10 or more for all regular seats priced $60 and above. Groups purchasing blocks will receive a $10 discount per ticket. Group tickets may be ordered using this order form. Detailed group ticket ordering instructions and restrictions here. Questions? Please contact Robert Sokol at awards@theatrebayarea.org. The Bay Area is home to magnificent art, and Theatre Bay Area is thrilled to recognize the outstanding achievements of the artists and companies whose work has moved us, challenged us, taught us and changed us. So, it is with great excitement that Theatre Bay Area announces the fabulous finalists for the 2014 TBA Awards. This list represents not only the superlative efforts of the companies and people named below, but the dedication of the 200+ professional peer adjudicators whose diligent work has made this program possible. And now we get to share the news with you! All of these fantastic finalists are (or are connected to) productions that ran between January 1 and August 31 of this year. If the list looks long, consider how many artists and productions were eligible: over the course of eight months, the 200 adjudicators cast 2,924 ballots, with a total of 37,388 individual ballot lines (the different categories for a single production which one might evaluate) on 183 submitted productions by 78 participating Bay Area companies. That's pretty amazing! Congratulations to all! Thank you for a tremendous, vibrant season of theatre. We're looking forward to many more to come. Next, come to our glamorous TBA Awards Celebration to see who takes home the awards! The TBA Awards Celebration will be held on Monday, November 10, at A.C.T. 's Geary Theater in San Francisco. Want to participate in the 2014-2015 TBA Awards season? Sign your company up, or apply to adjudicate! View the TBA Awards Finalist Announcement Videos! We're pleased as punch to announce the first-ever round of fabulous TBA Awards Finalists. And we're going digital, like the crazy kids we are, to share the exciting news with you! Come to the glamorous inaugural TBA Awards Celebration on November 10 at American Conservatory Theater to see which friends and colleagues will take home TBA Awards of their very own! Congratulations to all the 2014 TBA Awards Finalists! Now come cheer them on at the TBA Awards Celebration on November 10 at A.C.T. 's historic Geary Theater! The moment we've all been waiting for is nigh—the announcement of the TBA Awards finalists! Starting at 10 a.m. on Thursday, September 18, Theatre Bay Area will roll out a series of brief YouTube videos announcing the first-ever group of finalists for the TBA Awards! A new video will go public every half hour, from 10 a.m. to 3:30 p.m. In each video, a TBA staffer will announce the finalists in one or more awards categories. (See list of awards categories here). Then, at 4 p.m., the entire list of finalists will be posted on the main TBA Awards page! Tune in on Thursday, September 18, to see who you'll be cheering on at the Awards Celebration November 10! Tickets go on sale to the public on September 26. TBA Awards Celebration: Save the Date! 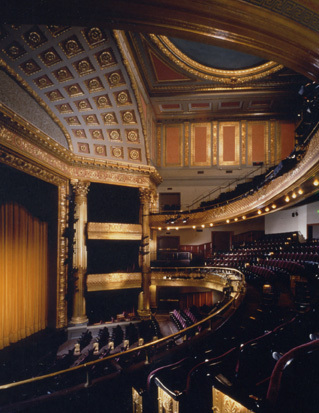 The Bay Area is home to hundreds of theatre companies producing thousands of performances. From puppets to Pippin and ensemble work to Endgame, our region boasts one of the most vital, committed and diverse theatre scenes in the nation. This year, for the first time, excellence in Bay Area theatre will be recognized and celebrated by a professional, region-wide, peer-adjudicated theatre awards program: The TBA Awards. This inaugural TBA Awards season culminates in the fabulous TBA Awards Celebration, held at American Conservatory Theater's historic Geary Theater. Winners will be presented with awards in over 60 categories, cheered on by their colleagues, supporters and creative community. Tickets to the TBA Awards Celebration will go on sale to the public on September 26. Group discounts will be available as well, making it easy for companies and friends to attend and applaud the winners!